Patrick Woodward received B.S. degrees in Chemistry and Engineering from Idaho State University in 1991. He went on to study solid state chemistry with Art Sleight at Oregon State University, earning a M.S. in Materials Science and a Ph.D. in Chemistry in 1996. This was followed by a postdoctoral appointment in the Physics Department at the National Synchrotron LightSource, working on advanced x-ray and neutron powder diffraction techniques under the supervision of Dave Cox. He came to Ohio State University as an assistant professor in 1998. 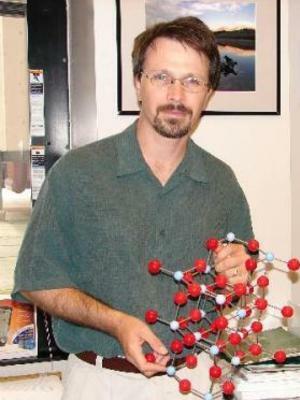 He received a CAREER Award from the National Science Foundation in 2001 and was promoted to Associate Professor in 2004. Understanding and rational design of the optical and electrical properties of semiconducting oxides and oxynitrides. Our research in thisarea is spurred by the desire to discover new photocatalytic materials and transparent conductors. Photocatalysts are used to decompose organic andheavy metal contaminants in water supplies, to split water into hydrogen and oxygen, in self cleaning windows, and to eliminate foul smelling moleculesfrom the air. Transparent conductors find widespread application in flat panel displays, LED's, smart windows, and antistatic coatings. Coupled electronic and magnetic properties of transition metal oxides.This research is motivated in part by the search for new magnetoresistive compounds. Such compounds are the central component of the read head in your computer. Study and design of new dielectric materials. Dielectric materials are ubiquitous in modern electronics, including cellular phones, satellitec ommunications, and radar systems, yet the design of new dielectric materials is still largely empirically based. Prediction of the crystal structures of extended inorganic solids from their composition. Structure determination and refinement using powder diffraction techniques. We utilize a variety of diffraction analysis as an integral part of our research effort, including Rietveld refinements, ab-initio structure solution from powder data, thermodiffractometry, synchrotron and neutron powder diffraction. "Intermolecular recognition and crystal packing in molybdenum and tungsten coordination polymers as deduced from powder X-ray diffraction data" M.H. Chisholm, P.J. Wilson, P.M. Woodward, Chem. Commun. 566-567 (2002). "Predictions of the Crystal Structures of Perovskites Using the Software Program SPuDS" M.W. Lufaso & P.M. Woodward, Acta Cryst. B 57, 725-738(2001). "Phase separation over an extended compositional range: Studies of theCa1-xBixMnO3 (x <= 0.25) phase diagram" P.N. Santhosh, J. Goldberger, P.M. Woodward, T. Vogt, W.P. Lee, A.J. Epstein, Phys. Rev. B 62, 14928-14942(2000). "Intermediate to High Spin State Transition Induced by Charge Ordering in Antiferromagnetic YBaCo2O5" T.Vogt, P.M. Woodward, P. Karen , B.A. Hunter, P. Henning, A.R. Moodenbaugh, Phys. Rev. Lett. 84, 2969-2972 (2000). "Octahedral Tilting in Perovskites I-II. Geometrical Considerations" P.M. Woodward, Acta Cryst. B 53, 32-66 (1997).